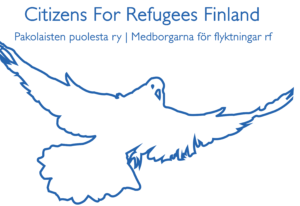 Citizens for Refugees Finland is an independent, nonprofit as well as politically and religiously nonpartisan association operating in Finland. The association supports the needs of asylum seekers and refugees in Finland by monitoring: a) the legality and transparency during the asylum process, b) the realization and respect for human rights and other relevant international agreements ratified by Finland. We increase public awareness in Finland about the problems asylum seekers and refugees face in the legal protection and human rights realization during the asylum process; We advocate and support refugees’ familiarization with Finland and Finnish people, and vice versa, as an addition to the Act on the Integration of Immigrants and Reception of Asylum Seekers. We support refugees in receiving information and access to services while also promoting cooperation between different service providers operating in Finland; We create encounters between migrants and Finnish citizens for social cohesion in the long-term.